Right now Rocketmiles is offering a bonus promotion through American Airlines Advantage program where you could earn up to 5,000 American Airlines miles on your first booking through Rocketmiles. Rocketmiles is an hotel booking service that allows you to choose from dozens of Frequent Flier programs and credit your account anywhere between 1,000 – 5,000 miles per night. 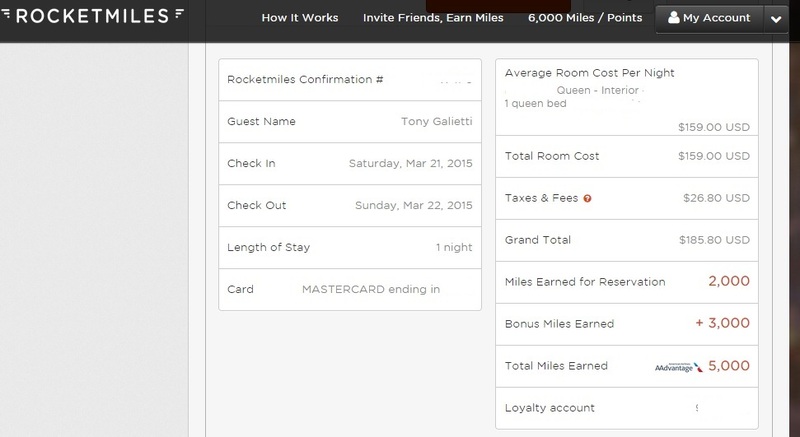 Rocketmiles is free to join and if you use our referral link to join we will get 1,000 bonus miles and you will get 1,000 bonus miles on your first stay. If you couple this with the current American Airline bonus offer you could earn up to 6,000 miles on 1 stay. Not all hotels qualify for bonus miles, but its a free program to use and a great way to build airline miles on stays that you already have to make anyhow. We just signed up for this promotion and have decided to use it for a 1 night stay in Phoenix this March. Once you sign up for an account you will be able to refer your own friends and family as well and earn a bonus on anyone who signs up and books a stay after using your initial referral link. Good luck and happy booking!